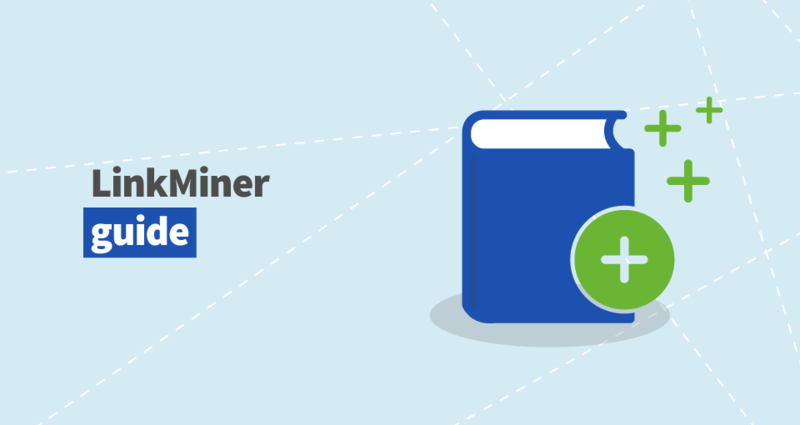 We’ve prepared a step-by-step guide for LinkMiner, a brand new backlink analysis tool we recently launched! We’ll cover all important topics and features so you can get the best of the tool. Don’t forget to explore all LinkMiner features and videos to see how they help you in backlink analysis. LinkMiner is an easy-to-use backlink checker tool focusing on backlinks you can replicate easily. The tool is designed to evaluate backlink data by providing different metrics, embedded link previews and features to filter and save the most interesting links. In case you aren’t registered, you can create your free account. Is the term “backlink” new for you? 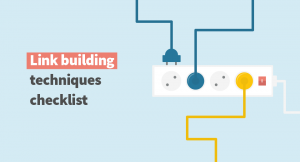 Don’t hesitate to find out what backlinks are, what types there are and how to optimize anchor texts correctly. Once you are in the tool, just type a valid domain or exact URL into the main search window and click on the green button “Find backlinks”. You can also select the option to display only “One link per ref. domain”. Leave the checkbox empty to display multiple links per referring domain. Let’s say we want to find backlinks of this root domain: “hse.gov.uk”. 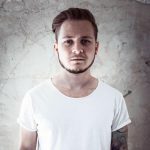 “example.com” isn’t the same as “www.example.com” or “https://example.com”. Select the input according to data you would like to analyze. We recommend the root domain as the main input. You can switch between them anytime. Don’t forget to click on the magnifier to load the backlinks. The Link Strength is a new metric we developed to evaluate the power of backlink considering various factors such as Citation Flow, Trust Flow, Do/NoFollow attributes, number of referring domains and other metrics. This metric is all about saving time. Instead of analyzing a bunch of metrics we have created an algorithm that identifies the potential of each backlink. When you click on the button “Load more”, 50 more backlinks will load. LinkMiner doesn’t automatically load all links from the database as its main focus is to provide powerful links instead of throw thousands to you. Let’s say you want to see Quora or Reddit backlinks. You’ll find them in the Q&A category so you can replicate them in seconds in case you’re in hurry. You’ll find the categories above the results table. You can see backlinks from all categories by default. Clicking on a particular category will hide those results. Turn on and off any of them as you wish to see backlinks you are interested in. Let’s narrow the backlink analysis by specific preferences. 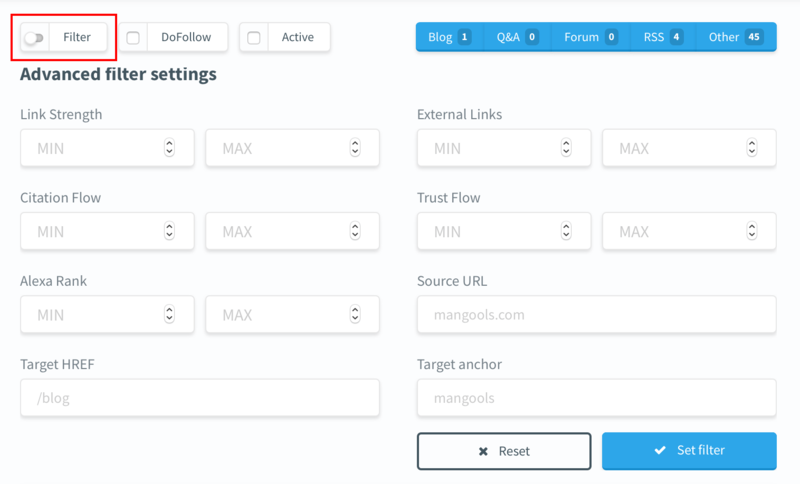 “Filter” lets you display backlinks with specific values of selected metrics or attributes. You can turn it on/off anytime while it keeps your settings safe until you decide to reset. Display only “DoFollow” and/or “Active” links by clicking on one of the two buttons above the results table. This is one of the main time-saving features of the tool. Live website preview is located in the right part of the dashboard. Just click on one of the backlinks to load it. In the website preview, there’s the anchor text in the top right corner. Click on it to automatically scroll to the exact position of the anchor text. It’s highlighted in a yellow rectangle with an orange border. 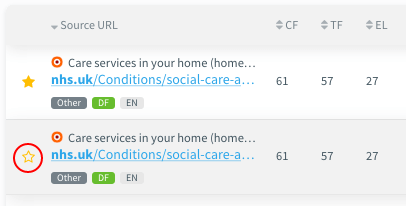 On top of that, you can open the URL in a new window or analyze it in SERPChecker by clicking on the button “URL Profile”. The Favorites list is a great way to save selected links for the future. This way, you can keep those links of competitors you would like to replicate. Click on the star next to a backlink and LinkMiner will automatically create a new Favorites list for you. You can access the Favorites list in the top left menu of the app. Over here, there’s an option to open or delete the lists. Exporting results from LinkMiner is a one-click effort. The feature is located under the top right corner of the backlinks table. It will export currently loaded backlinks. 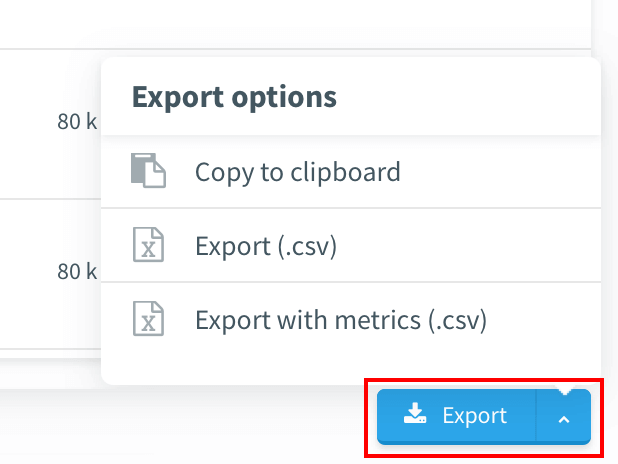 You can either copy the backlinks to clipboard or export them with or without metrics as a CSV file. If you have any questions or tips what to include in the guide, feel free to share them in the comments below. If you still have troubles using LinkMiner, don’t hesitate to ask via live chat or email.